It’s our summer festival season! 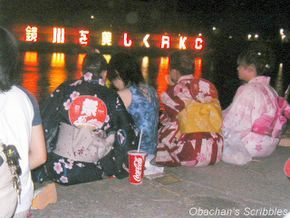 This Kagamigawa Festival is held on the last 3 days of July every year on the riverbank of the Kagamigawa (Kagami river) which runs through Kochi city. 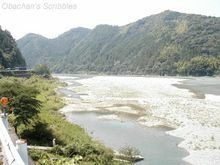 Kagami means mirror in Japanese, and as the name indicates, the river water looks fairly clean. I don’t know how and when this festival started, but at least now there seems to be almost no religious aspect attached to it. 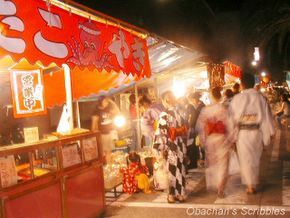 (I’m not sure, though, because it is held right next to a big shrine…) Anyway, at this festival, many food/drink stalls line up and events such as game shows, a haunted house and Karaoke contest take place. Usually several professional singers and impersonators come and have small concerts/shows during this festival. The path to the festival venue on the riverbank was decorated with many lanterns. 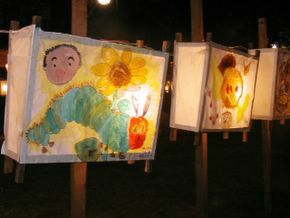 The square ones underneith the red-and-white ones were lanterns made of Japanese paper with pictures by local elementary school kids on. When they were lit at night, they looked like this. The 2 main attractions of this festival are flower towers and whale-shaped floats. This is one of the two flower towers on the riverbank. 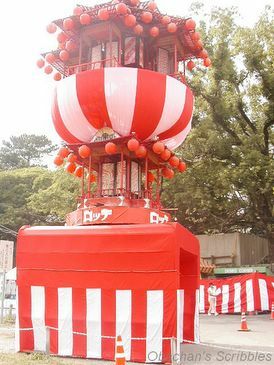 I couldn’t find any background information on the net about the flower towers of this festival, except that they may be a remnant of decorated floats people used for religious festivals in the past…before WWII. The square part at the bottom was like a small tunnel and people could walk through it. 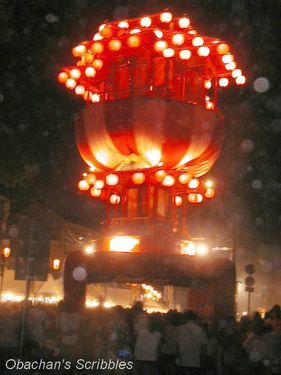 When the lanterns were lit late in the evening, the top part started turning slowly. The whales must be a parent and a child. A name of our local Sake brand was written all over the bigger one. I heard that the daddy (I think... it doesn't look like a mom, does it?) 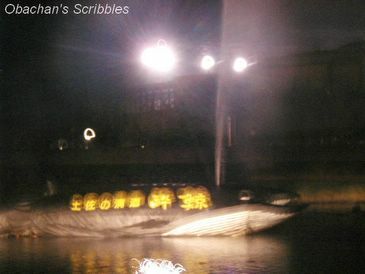 whale could pump up the river water and blow it up in the air as high as 50 m.
It was so nice to see young girls and even guys in yukata (lighter kimono for summer season). Though I don’t have one, I really love yukata. In the past, there were times that the Japanese was so obsessed with being Westernized and disregarded traditional clothes including yukata. It has been changing, though. These days, even teenagers’ magazines feature “how to put on yukata by yourself” and I’m happy about it. 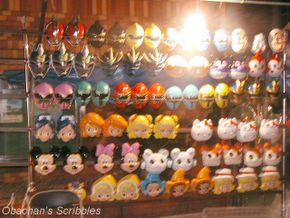 I love to take a look at the toys they sell at the festival, especially this kind of masks. They keep me updeated with what kind of animation characters are popular among kids now. 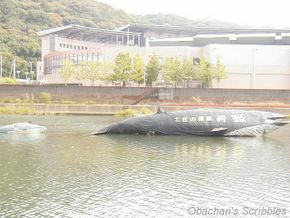 It was so nice sitting by the river, enjoying the refreshing breeze and watching the whale blowing the river water up in the air. These girls were sitting right in front of me and didn't know that I took a shot of them. What was terrible was that the place was way too crowded!! The site was flooded with people going from one place to another and those waiting in lines in front of food stalls. It took hours to get beers and some food for me and my friend, mainly because I couldn’t make my way through the crowd. We were starving and I was so stressed while standing in line for a L O N G time to buy us yakitori, age-takoyaki (deep-fried takoyaki), French fries and beers. After we finished our first round of food and drink, my friend went into the crowd again to get us edamame and some more beers. Of course we didn’t leave there without eating ice cream. :) I didn’t take any pic of the food we had there. I told you, we were starving. And the flower tower looked so beautiful in the dark. Doesn’t this new template look more “Japanese?” than the one before? My mind is getting more and more occupied with the big dance festival coming soon, and my blog is, too, accordingly. For this festival, each dance team designs their original costume, and very often they use traditional kimono patterns somewhere in the costume, like this. So I tried it on my blog template. I’m not sure what this should be called… even in Japanese. I often call it “heat rash” but maybe technically it is not. “It” means the skin problem I have every summer from working at the hot and humid Izakaya kitchen. The place is air-conditioned… or more precisely, there is a duct coming into the kitchen which brings a little bit cool air in. One privileged person who can stand right underneath the duct can enjoy the subtle coolness. That’s it. The rest of the kitchen is … well, you don’t want to know. Anyway, after sweating a lot there, I always find my skin really roughened around my neck, in the cheeks and forehead. Just looking at my skin, I can’t see anything abnormal … it is not red and not blister-like at all. But if I feel my skin, it is awfully rough where it sweats a lot. I thought this could be called “sweat rash,” but I’m not sure because it doesn’t show “the eruption of small red papules” as mentioned on some online medical dictionary sites. Every year this happens, and it subsides if I don’t work there for a couple of days and cures completely when the weather becomes cooler. So I’m not too worried, but I sure don’t like touching the roughened parts of my skin when I wash my face. 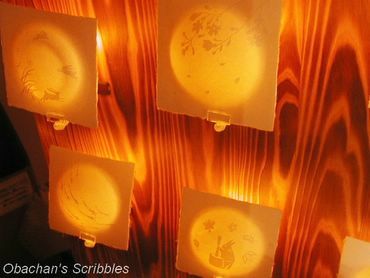 On my way back to Kochi city from the paper craft village, I dropped by Ino-cho Paper museum in the center of Ino town. 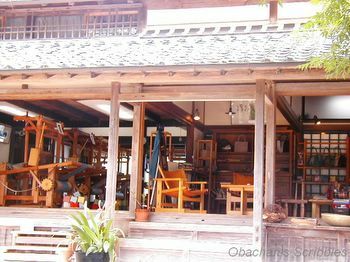 I do not come outside Kochi city very often, so I wanted to see as many places as possible on this one-day trip. The souvenir shop there has more variety of washi paper crafts. What really fascinated me (though I didn’t buy any, of course) was these… what do you actually call these? Paper shades? 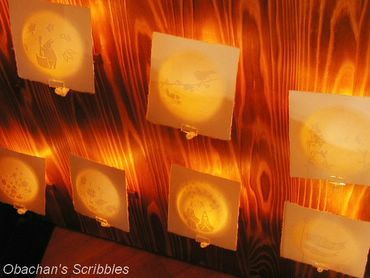 They are made to be placed (maybe clipped to a hook or something) in front of light bulbs so that the light from the back will show the patterns on the Washi shade. I had no idea how they made those complicated designs on the shades. Those patterns did not look like they were cut-and-pasted on the shades. I bought a pack of small Tengu paper pieces for souvenir. 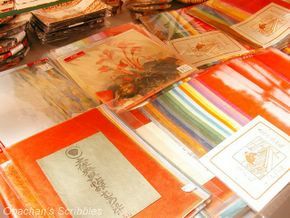 Tengu paper is super-thin washi paper in delicate colors and used for chigiri-e (torn paper art). 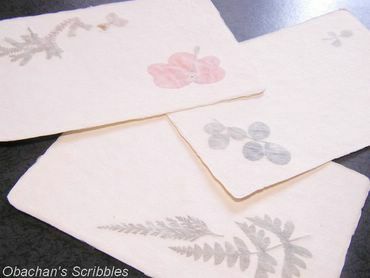 It was certainly delightful to discover different expressions that paper can offer. 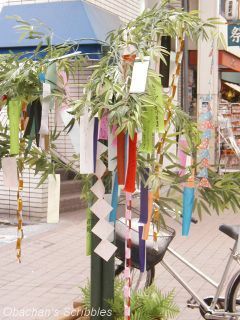 It is something that can convey warmth and healing in communication. And there was a nice coffee shop near the entrance of the museum. In the afternoon, I tried something else… this time, weaving. It was something I had been wanting to try since my childhood. A reservation was necessary, and I had taken care of it several days in advance. One disappointment was that though I wanted to try the least expensive course that I had seen on their website, coaster-making (30-minutes for 700 yen), I was told that it was the special, quick version for kids and group visitors only. 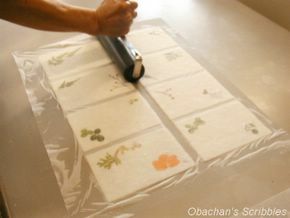 The least expensive course for regular visitors was 20cm vase-mat making for 1400 yen. Well, no other choice. Then she let me choose weft threads and said I could use more than one color. 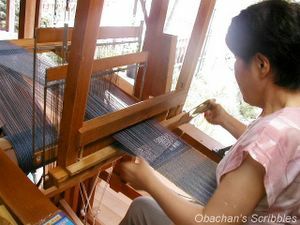 After setting the weft thread to the shuttle for me, she taught me how to weave. 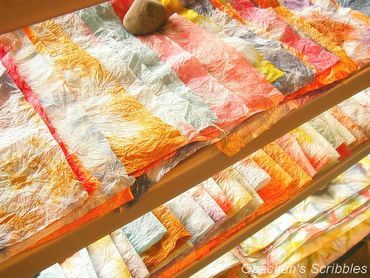 Honestly, it was not too difficult and I felt so good watching the textile growing longer. Actually, the color of my vase mat turned out very different from what I had thought beforehand. 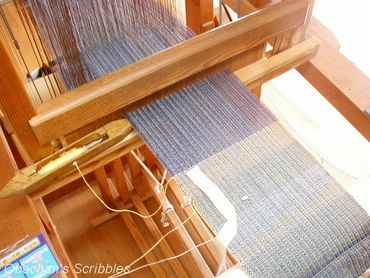 When I chose the weft threads in the beginning, I expected their colors to show a lot more in the final product, but they didn’t. So my vase mat looked rather plain and gray all over. Nevertheless, it was not bad. She offered me a glass of iced tea and asked me to wait until she finishes giving my vase mat a final touch -- brush fringe on 2 sides. 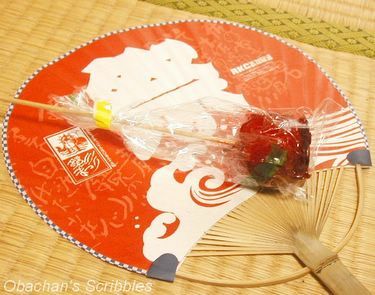 When I finished my tea, she handed me this vase mat… MY vase mat which is the one and only piece of work in the whole world. I'm thinking about giving this to my mom. After all, I enjoyed my experience in this small, quiet village, and the souvenirs I brought back are very special with vivid remembrance of the time I spent there. To be honest, I was so tempted to try the canoeing lesson for beginners, too. If it weren’t way beyond my budget, I would have, because it was terribly hot and the river water looked just too cool and soothing. Another thing I was tempted to try but couldn’t was the French cuisine they served at the restaurant. According to their ad, there you can enjoy the creative French dishes by the chef who won the gold medal at the 21st World Culinary Olympics 2004. The “lunch set” by the chef was over 1000 yen and there was NO bank/ATM machine in the village (the receptionist said that the closest one was 15 minutes away by car), so I gave up on the adventure. Instead, I had a bowl of cold udon flavored with green laver kneaded into the dough. It cost about half of the French lunch and I liked it very much. 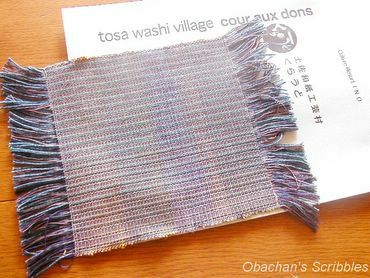 * Paper and weaving workshops are closed on Wed.
Ino is a quiet small town which is famous for the production of Tosa Washi (Japanese paper produced in Kochi). 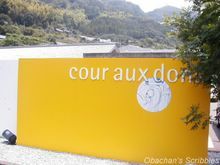 In its mountainous part close to the Niyodo river, there is a small village called "Tosa Washi Village," nicknamed “Kuraudo,” and, for some reason, spelled “cour aux dons” in French at the entrance of the village. Their ad on the net says this French translates as “courtyard of talent” or something (correct me!). 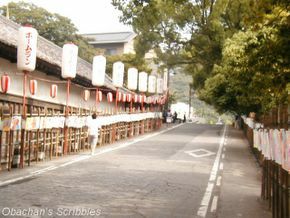 Seems like they wanted a name related to “Kura (traditional store houses)” reserved in this area and also somewhat associated with a Japanese word for “skilled craftsmen” as well as the word "crowd" in English, and wanted to make the name look unique in French spelling. 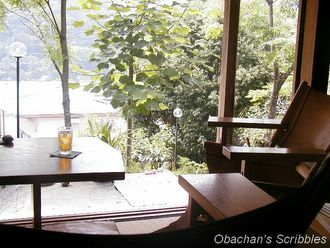 "Kuraudo" is a sort of weekend-resort with accommodation facility and open-air bath where tourists can experience making local traditional handcrafts, and even canoeing!! 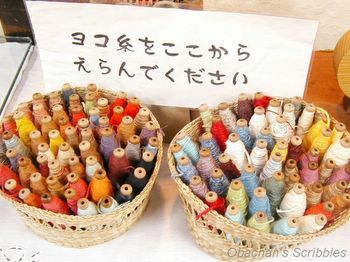 There are good variety of craft-making that you can experience there for different prices. 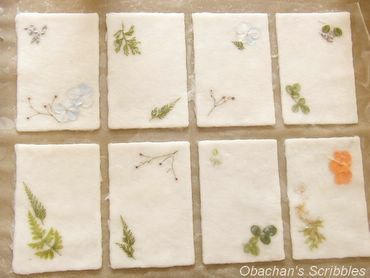 The first thing I tried was making eight Washi (Japanese paper) postcards, which was an apx. 40 minutes process and cost 400 yen for plain ones, 600 yen if used leaves/flowers for decoration, no reservation necessary unless you are a group of more than 20 people. The easiest way to get to the paper workshop is to enter the restaurant-like looking main building and exit the back door. 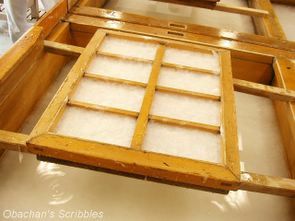 At the workshop, a Japanese lady took me to big wooden tubs filled with pulp-water mixture, and told me to scoop some of the mixture with the screened wooden frame and shake it back-and-forth, side-by-side, to distribute the mixture evenly in the frame. Next I was told to turn it over on a sheet of paper and push to release the molded pulp mixture from the frame. Then there came the fun part… The lady told me to pick whatever I like from the leaves and flowers provided on the nearby table to put on the would-be postcards. I didn't want to spend too much time there, so made it as simple as possible, but enjoyed making my own designs with the plants. When I told the lady that I was done, she told me to push that screened frame onto the would-be postcards again to make a thin layer of pulp on top of the leaves and flowers on the cards. 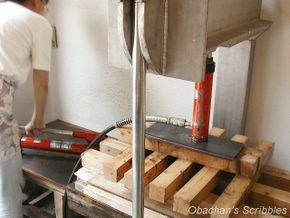 After that process, she took my postcards to a compressor to press the water out of the paper. 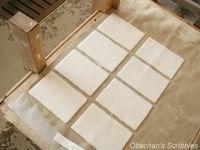 Then my postcards were taken to the steam-dryer. 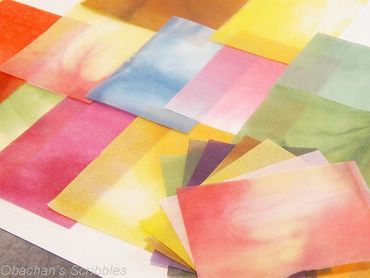 She slightly moistened my postcards, placed them on something looked like a big metal tank with a flat top, placed a thin sheet of paper over my postcards and pressed them with a hand roller. According to her, the steam filled in the tank keeps it hot to dry the paper placed on top. The drying took about 30 minutes. I spent the 30 minutes taking pictures of the souvenirs and filling out the questionnaires they had given me. 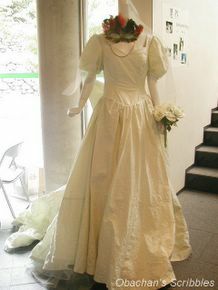 The photo on the left is a wedding dress made from Tosa washi paper! On the wall were some pics of a woman wearing the wedding dress outside this building. That dress would definitely require a sunny day for wedding. Then the lady came to me and handed me my postcards. Actually there were a few that didn’t turn out very good, but these three look pretty nice. Not bad as a starter. Just one more month to the dance festival! As a middle-aged woman suffering from a mild sleep disorder, I felt the need to have a routine exercise time, in addition to the brief dance practice at home, to be ready for the physically demanding task in August. I guess this idea itself was not such a bad one. Today I walked up and down the stone steps at the castle, thinking it would be a good exercise for my legs. Now probably THAT was a bad idea. 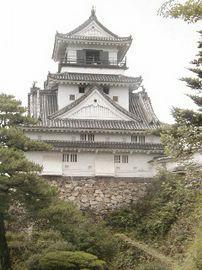 When I visited the castle for sightseeing last January, the tour guide told me that basically all the steps there were made in the way that they would give enemies a hard time getting in from outside. No wonder the distance between the steps there always looked rather awkward to me. Unfortunately I didn't recall what the tour guide had said until I started feeling a pain in my right knee. 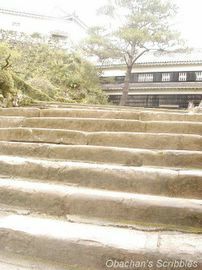 I should have known that using those steps could cause more damage to my aged legs than making them stronger. I felt so tired after the exercise, and felt very lazy at night when working at the izakaya. Certainly I’m not cut out to be a ninja. HOW MANY OF YOUR DREAMS HAVE COME TRUE? 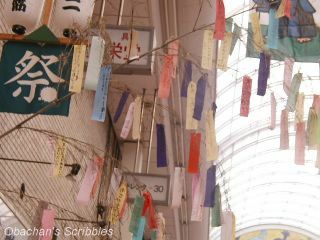 Although I don’t write my wishes on a piece of paper for tanabata matsuri any more, I do have some wishes, just like you probably do. Among some almost-impossible ones, there is one that looks relatively feasible. The wish, or dream is: living in a house near the ocean with a big dog. I want to walk the dog on the beach, being surrounded by the sound of waves and watching the sun setting into the ocean. BTW, I did say a big dog, but I don’t mean really really big one. I certainly can not take care of a dog as big as Buck Bundy. When I met the lady living downstairs this afternoon, she told me that she had a real bad day today at work. The computer trouble, miscommunication, unfortunate happenings coming all at once… She said she was so upset when she came back to her room that she started weeding the backyard of this apartment. Well, tomorrow is going to be my turn to have a bad day. Yesterday at work, I found some things that would most likely result in a trouble, and I’m going to find out the result tomorrow. I asked her not to weed the whole backyard this afternoon.